The most likely source of high voltages in electronic equipment is in power supplies to cathode ray tubes (CRT’s) in oscilloscopes, spectrum analysers, monitors and televisions. For example: the Tektronix 468 Digital Storage Oscilloscope high voltage oscillator produces -2,450Vdc and the high voltage multiplier produces +15,500Vdc; the HP 141T Spectrum Analyser Display Section high voltage oscillator produces -2,450Vdc and the high voltage multiplier produces +6,600Vdc; and the HP 1980B Oscilloscope high voltage oscillator produces +2,750Vdc and the high voltage multiplier produces +16,500Vdc. There is some confusion as to what constitutes a low, medium or high voltage. The European Union defines1 low voltage as: between 50Vac & 1,000Vac; and between 75Vdc & 1,500Vdc. For my own 'electronics' purpose, high voltage is defined as any voltage above mains supply voltage, standardised at 230Vac ±10% in Europe. In practice, most standard Digital Multimeters (DMM’s) have a maximum voltage measurement capability of 1,000Vdc or 700V rms ac, both with a 10MΩ input impedance. 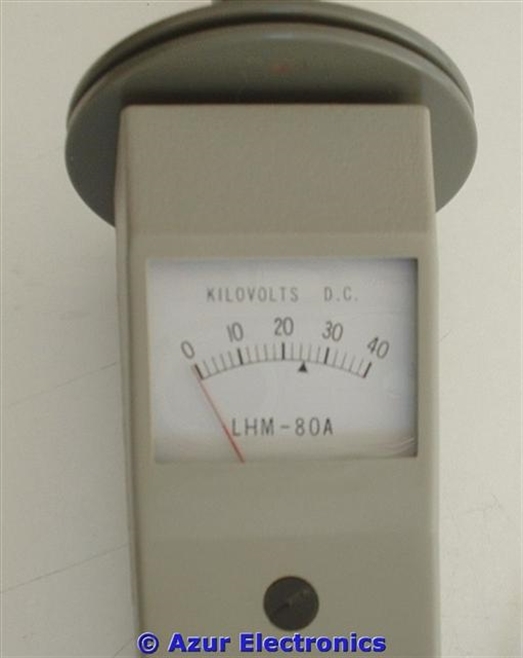 To make voltage measurements higher than this, specialist equipment is required. Making measurements at any voltage can be dangerous, especially when current can be sourced as well, so safety precautions must be taken. A 12V car battery can supply 200A. A 16kV eht may supply 150mA. Both constitute 2,400W of potentially lethal power! Ref 1 - The Low Voltage Directive (LVD) 2006/95/EC (*) seeks to ensure that electrical equipment within certain voltage limits both provides a high level of protection for European citizens and enjoys a Single Market in the European Union. The Directive covers electrical equipment designed for use with a voltage rating of between 50 and 1000 V for alternating current and between 75 and 1500 V for direct current. It should be noted that these voltage ratings refer to the voltage of the electrical input or output, not to voltages that may appear inside the equipment. These may over-cautious, but high voltage can be very dangerous! Complacency can be fatal. 1. Do Not Make Assumptions! Check out the equipment first. There may be a fault which makes other areas unexpectedly at high voltage. 2. Inspect The Test Equipment. Check the probes for any damage. Make sure the probe is clean and clear of any conductive contamination. 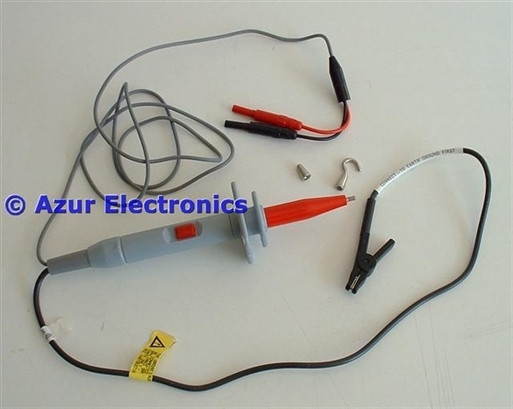 Use on a much lower voltage first to verify the probe is working correctly. 3. Inspect the Device Under Test (DUT). Ensure that the DUT is connected to mains earth. Ensure that any metal casing is connected to mains earth. Use a Megger to verify earthing. 4. Use A Bench Variac. Gradually wind up the supply voltage whilst watching the supply Ammeter for excessive current. Turn the power source off and give time for capacitors to discharge before connecting or disconnecting the probe. 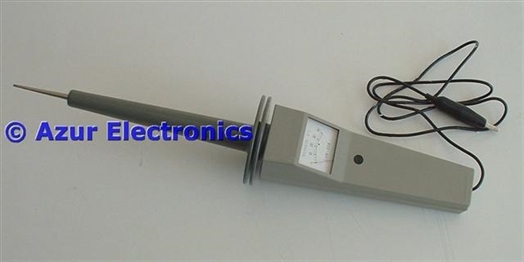 If possible, do not touch the probe when making measurements. NOTE: this is only suitable for linear power supplies, not SMPS (Switched Mode Power Supplies). 5. Protect Yourself. Only work in dry conditions. Wear thick gloves and safety goggles. Do not wear any jewellery. Keep one hand in your pocket. Stand on an insulated mat. Have a second person available (CPR)! 6. Watch Out For Corona! Pale blue colour, buzzing sound, smell of ozone. I have two high voltage probes. The first operates up to 6kV and is used with a DMM to provide an accurate reading by dividing the voltage by a factor of 1,000 times. The second operates up to 40kV and has an integral meter but with less accuracy. • Check all the safety precautions before making any measurement. • Connect the black crocodile clip to a reliable mains earth point. • Connect the red and black 4mm plugs to the DMM voltage input. • Select the highest voltage range (dc or ac as appropriate) on the DMM.